Conquer the kitchen with knives so sharp they never need sharpening. 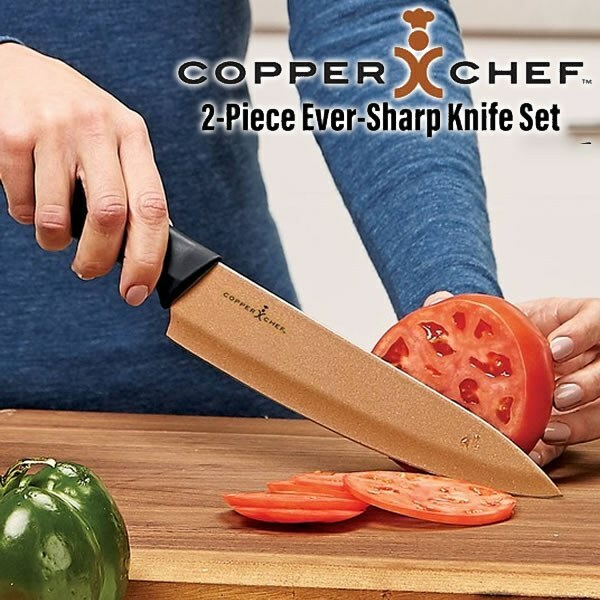 As seen on TV 2 piece Copper Chef Knife set includes an 8" professional chef&apos;s knife with cutout design that helps keep food from sticking to the blade and a 9" multi-purpose slicer with serrated blade and handy forked tip that pierces and slices. Perfect for cutting thin delicate slices or cutting into frozen foods. Each knife is designed with a razor-sharp stainless steel blade so strong it never needs sharpening. Features professional CeramiTech non-stick coating. Ergonomic, easy-grip handles ensure a safe, secure grip. With the Copper Chef Knife Set, you get everything you need to slice, dice, chop, mince, and carve easier and faster than even before. Slice away at your kitchen prep with this handy Copper Chef knife set. As with all copper products is fantastic, very sharp, great knifes.